Have you ever racked your brain to solve a tough work or personal issue, only for the perfect answer to randomly pop into your head while you’re in the shower? Research confirms over and over again that the busier you are, the more you benefit from quiet time throughout the day. And we’re not talking about time spent browsing your Facebook timeline or scrolling through your emails while feeling guilty about not working. We’re talking about time spent intentionally zonking out, like daydreaming in a quiet coffee shop, getting lost in a good book, or going for a leisurely stroll in the park. The practice of giving your brain a break has incredible health benefits that can fundamentally sculpt our personal and professional lives. It restores the nervous system, helps to sustain our energy, and mentally conditions us to be more responsive and adaptive to the complex environments where we live and work. Happify reports that this led to 30% higher focus, 50% greater creative-thinking capacity, and 46% higher health and wellbeing. Let’s examine some of the research supporting the need for regular breaks, and some tips from famously productive people to help give you a few actionable ideas. There’s an arsenal of research that supports the theory of how silence and quiet time affects our physiology, which in turn literally wires us for peak performance. For example, one study shows that silence is associated with new cell development in the hippocampus, the learning and memory region of the brain. Other studies reveal at least five resting-state networks in our brains – connected circuits for vision, movement, hearing, memory, and attention that come to life when our brains are relaxed and unfocused. Research also shows that this silence should be truly silent – a purposeful checkout instead of using time away from your desk to anxiously ruminate on your lengthy to-do list. Excessive rumination has been linked to burnout and overall lower happiness levels (which other studies confirm is linked to lower productivity). In other words, happier people have a better ability than unhappy people to let their minds wander and relax instead of constantly dwelling on their next moves. Happier people also have 31% higher productivity, 37% higher sales, and three times more productivity. We wanted to get into the minds of some of today’s top entrepreneurs and tech leaders, to learn their strategies for success and managing their workloads. We started the Productivity Giants Series, a collection of interviews that uncovers just that. One of the things that all our productivity giants have in common is recognizing how much stress and burnout can come from a flooded inbox. 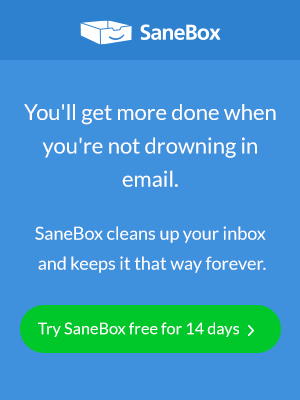 In this post, we outline the benefits of a clean inbox and some strategies to keep it organized and pristine. And here are a few tips on how to incorporate more restorative breaks (and how to manage your time to help feel like you can even afford those breaks). Nir Eyal, tech company founder and author of the bestseller “Hooked: How to Build Habit-Forming Products,” encourages entrepreneurs to be conscious and attentive to when their mind starts to wander. When this happens (and that’s a when, not an if), avoid stifling or straining those brief moments by piling on more thought-heavy activities. Instead of reflexively checking social media or his emails when he starts to zone out, he looks out the window and plays with prayer beads for a few moments. Tapping into the psychology that fuels the craze of the fidget spinner gadget – and hundreds of years of similar tools, like Baoding balls that date back to the Ming dynasty – using your hands may help to channel unfocused energy out of your brain and into your body, where it can be more easily released without interfering with your day’s productivity performance. Once you identify that you need a mental break, you can also devote those few minutes to any other movements that might help your body with needed energy release. Try doing a few stretches, giving yourself a massage, or even swaying or dancing to a song that relaxes you. If work has you feeling anxious as you begin to lose focus, occupying your hands or other parts of your body might be a simple way to shift to a more calm-and-ready mindset. Taking the previous step a bit farther, two of our interviewees swear by special exercises and practices geared toward de-cluttering the mind. Live and Dare analyzed more than 100 research papers on meditation and summarizes the benefits into an informative infographic. Among the key findings were that meditation increased focus 10-fold compared to control groups, and individuals with regular meditation practices experienced 75% less depression, 30% less anxiety, and 65% greater wellbeing. In addition to dozens of studies that confirm the health benefits of mindfulness, breathing exercises, and meditation, there are a handful of corporate giants that infuse the practices into their stress reduction programs. Among these names includes Apple, Google, Facebook, LinkedIn, Aetna, and Intel, just to name a few. While it may feel like you simply don’t have time to schedule a break, try examining your workflow habits to see where you can adjust. 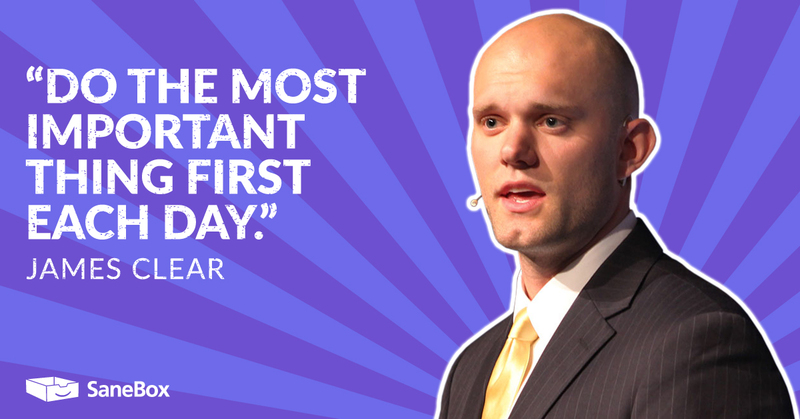 Author, photographer, and entrepreneur James Clear said that his number one productivity and time-saving tip is to do the most important thing first every day. Research confirms that adult brains function best in the morning, which becomes truer as we grow older. In a study from University of Toronto, all participants performed better in the morning, but the older test group was 10 percent more likely to succumb to distractions than the younger group. Knocking out the most important tasks first seems simple enough, but even James admits that he often gets sucked into non-urgent tasks or other less valuable uses of his time. If you have trouble choosing the most important task for the day, James suggests physically writing out all of your to-dos, then prioritizing and cutting out the lower ones. As a bonus, you’ll likely experience more motivation from the clarity of seeing the list written and organized. Okay… we may have tweaked the original saying, but it’s safe to say that most entrepreneurs can identify with it. Even the most productive people often feel like their to-do list infinitely re-populates once one item is checked off. While big to-do list is a great indicator that business is booming, it can be a double-edged sword if it starts to interfere with your “me time” – which can create a negative feedback loop that harms your physical and mental health. Science repeatedly proves that silence and quiet time are critical for our brains to function at their best. To fight off burnout and encourage your best performance, follow some advice from our Productivity Giants, like fully embracing those moments throughout the day where your mind wants to wander, and practicing quick techniques like meditation, breathing, and mindfulness. Try and make some room for these activities in your day by handling your most important tasks first. By padding in time to let your mind run free, you’re ultimately contributing to a more rested, productive, and creative self.